Powered Paragliding Gear Selection: Foot Launch or Trike? « Which AAD should I buy? Cypres or Vigil? Let me start out by saying that currently, most Powered Paragliding Pilots prefer foot launch. The reality is that foot launch is actually more difficult to learn and to master. Trikes are easier to learn on and are starting to get more popular. Both ways of launching are great. Take-off in higher winds with a reverse launch. If you are a bigger, heavier pilot and/or have some physical limitations such as bad knees or hips or are in less than optimal physical condition, a trike may be a better option. 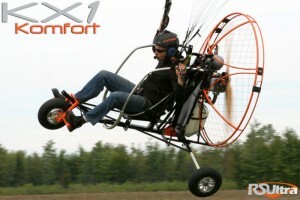 Launching a foot-lauched Paramotor is physically demanding. Learning to foot-launch a Paramotor is even more physically demanding. For foot-launching, you need to be able to run at full speed for about 50 metres with 70-80lbs of equipment on your back. If you can do this several times back to back with a little rest between and without any major physical discomfort you should be physically capable to foot launch. Lauching a trike is relatively easy, physically speaking, you just sit in your harness or seat, and launch. So in the end, unless there are some physical limitations, most people choose to foot launch. Trike always remains an option. Trike is also an interesting option for flying during our Canadian winters, where we can put skis on a trike for winter flying.